After more than four decades of official silence, Angola’s dirty secrets are being swept from under the carpet. Officially-sanctioned news reports denouncing specific cases of corruption in high places have mushroomed in a matter of months. People once thought to be untouchable are under investigation or already face criminal charges. José Filomeno dos Santos (Zenú), and his business associate Jean-Claude Bastos de Morais have been charged with misappropriating $500 million US dollars from the $5 billion US dollar Angolan Sovereign Wealth Fund. The fate of the rest of the fund has yet to be determined. Zenú’s elder sister, Isabel dos Santos, is alleged to have built a billion-dollar business empire based on nepotism and ‘loans’ of public money that have never been repaid. The evidence now emerging confirms the endemic corruption that Maka Angola has been reporting for years. There is, of course, a common denominator in the scandals involving Zenú, Isabel and so many others: their father, José Eduardo dos Santos, who stepped down as President of Angola last year. Who else could have facilitated, organized, permitted or authorized such widespread political corruption but the ‘capo di tutti capi’? 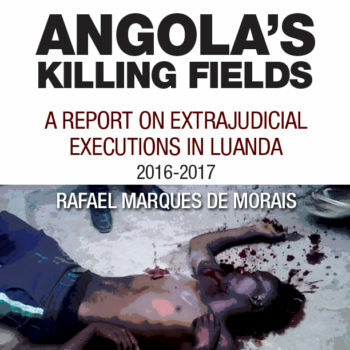 Yet whenever the former President’s name is mentioned in connection with these crimes against the state, Angolans shrug and say that nothing can be done because he secured immunity from prosecution for at least five years. Not so. “1. The President of the Republic shall not be liable for actions practiced in the exercise of his functions, except in the event of corruption, treason and the crimes defined in this Constitution as imprescriptible and ineligible for amnesty. Clauses 1 and 3 of Article 127 clearly distinguish between crimes committed in the exercise of presidential duties and crimes committed that were not a function of his official duties. Consequently there are distinct procedures (and treatment of immunity) for these differing circumstances. Firstly, let’s examine Clause 3 and the five-year delay, a rule which only applies to crimes committed by the President outside the scope of his official duties. Let’s take a hypothetical example: one fine Sunday morning the serving President decides to make use of his free time to drive his private vehicle to the ocean where he intends to swim. Along the way, while driving with excessive speed, he collides with a pedestrian who is killed. His actions might give rise to charges of homicide, criminal negligence or dangerous driving – all of which have nothing to do with the driver’s occupation. If a crime has been committed, it was not in the exercise of his presidential office. In this instance, Article 127 (3) applies. That is, the President of the Republic can only be tried for these offences five years after his term has ended, and by the Supreme Court. The five-year moratorium only applies in this type of situation. So what happens if the president commits a crime while discharging his official duties? That depends on the crime. He has immunity from prosecution for all lesser crimes. Only serious crimes, as identified in Article 127 (1) of the Constitution – such as corruption, treason and others – are excluded. 2) Embezzlement – when an official diverts funds belonging to others for their own personal benefit, e.g. the unscrupulous and illegal use of a politician’s authority for personal gain, when funds intended for public projects are intentionally misdirected in order to maximize the benefits to illegally private interests of the corrupted individual(s) and their cronies. coerce that person into cooperating with them. makes appointments in exchange for votes, payoffs or other benefits. The crimes of which Dos Santos’s children stand accused, and in which the former President may be implicated by the evidence, can be framed within Article 127 (1). That is, they fall within the definitions of political corruption, one of the serious crimes for which immunity is excluded, thus permitting the initiation of criminal investigation and prosecution. Instituting criminal proceedings against a serving President is complex. Article 129 of the Constitution stipulates the procedures to be followed by the National Assembly and the Supreme Court that could ultimately lead to the President’s impeachment and dismissal. However, Dos Santos is no longer the serving President of Angola and hence serious crimes committed in the exercise of his official duties are no longer subject to Article 129 of the Constitution. He cannot be impeached nor dismissed from the Presidency, nor is any amnesty or prescription applied. As a former President, his actions while in office are governed by Articles 133, 135 and 150 of the Angolan Constitution. Article 133 (1) concerning former presidents of the Republic, gives way to Article 135 (3), regarding the members of the Council of the Republic, which in turn sends us to Article 150, which refers to immunity for members of the Angolan national assembly or parliament. The effect is to apply the immunity rules protecting members of parliament to former Presidents. This means that if the judicial authorities believe there is sufficient material evidence to warrant an investigation, they may open a case, undertake an investigation and indict any MP, even a former President, on criminal charges. Only at this stage is the National Assembly required to rule on the suspension of immunity and referral to the Supreme Court, thus permitting the case to go to trial. It cannot be emphasized enough: Angolan law, as it currently stands, places no obstacle in the way of the judicial authorities to investigate or prosecute a former President for serious crimes. Hence, if there is material evidence of serious criminal behaviour by José Eduardo dos Santos when he served as President, then there is no impediment to the judicial authorities ordering a full investigation. That is, in fact, their duty. If the investigation results in sufficient evidence to lay charges, then the evidence and indictments must be presented to the National Assembly to rule on whether (or not) to rescind immunity and remit the case to the Supreme Court. In short, the judicial authorities are free to conduct investigations into the actions of former Presidents in the exercise of their official duties, and to draw conclusions about whether such actions could be construed as serious crimes under the constitution. If they so conclude, then they must issue an indictment and present it to the National Assembly to decide whether or not to to take the former President to trial. The five-year rule does not apply to actions performed in the exercise of presidential duties, only to private actions. If Angola is serious about tackling corruption and recovering the stolen billions, then it is right and proper that the actions of the former President be investigated. Should that result in an indictment, it will be a matter for the National Assembly to decide whether to rescind immunity and take him to trial. That would be a political decision and they would, no doubt, weigh their judgement in the interests of peace and national reconciliation, as is their sovereign right. Whatever the outcome, at least the nation would learn the truth.